"The Dune Collection is an 8 piece set inspired by the 1965 epic science fiction novel by Frank Herbert. An absolute sci-fi classic and a favourite of mine. This collection channels particularly warm tones and holographic microglitters." All swatches are done with a peel off basecoat and top coat. Starting with my favorite, Blue-Within-Blue Eyes. I used 3 coats here, because I wasn't sure how the thermal effect would look, but I think 2 will be fine as well. And I bet this'll look lovely when layered on a blue or black too! It goes from a lovely light blue (warm) to a rich blue when cold, and because of the purple shimmer, it'll look more blurple then as well. Here we have 2 coats of Genetic Memory, a purple base that leans brown, and has a flash of blue in it. The basecolor combined with the color of those mini flakies make for a warm color, with a slightly cooler flash. A golden holographic glitter that covers in 2 coats: Grandfather Of The Desert. What can I say here, it's exactly what you'd expect of a gold holo glitter, and it'll be great for the holidays as well! I guess it doesn't come as a surprise that this is a 2-coater as well! Sandscrawler has a golden base with an orange to green duochrome effect. Not the strongest duochrome you can imagine, but as usual with FFC, unique and pretty! Another favorite of mine, The Secret Coinage. I used 3 coats here, and that creates a salmon pink color that can lean a little gold here and there (or is it golden holo glitters? 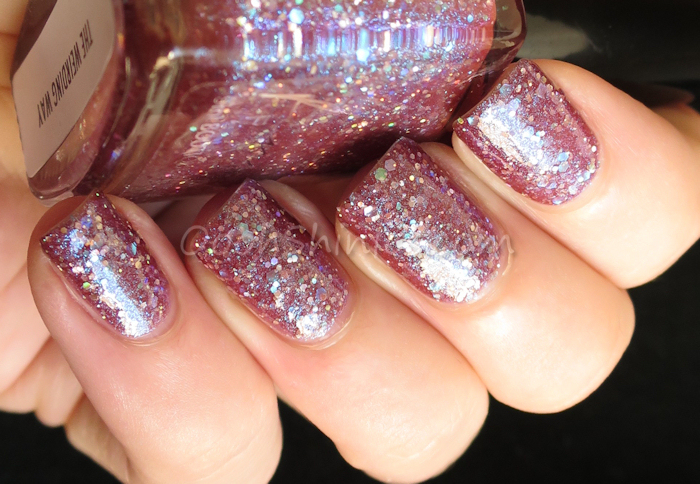 Ehh...), which is packed with holographic glitters, a strong pink shimmer and if that's not enough, little flakies! On the pic below you can see the holographic effect a little better, the macroshot below that shows the shimmer and flakies well. Let's continue with The Weirding Way, shown here with 2 coats. The strong blue shimmer and holographic glitter give me yet another challenge in describing the color, haha! I'd say a red/brown/purple (with 3 guesses I can't be too far off ;)). The last polish of the collection is Voice Of The Outer World, and just as with the previous thermal, I used 3 coats here but probably could've gotten away with 2. This thermal goes from clear (warm) to purple (cold), but even when it's clear it looks a little blue thanks to the strong shimmer. Even though this has such a strong shimmer and of course all those little blue flakies, the cold basecolor still is a real purple, not a blurple. The Dune Collection will be available from 1-5 November on the Femme Fatale Cosmetics website, and in various webshops like Shiro Cosmetics, Live Love Polish, Color4Nails, Beautometry, Rainbow Connection, Beauty So Fly and Dope Nails.